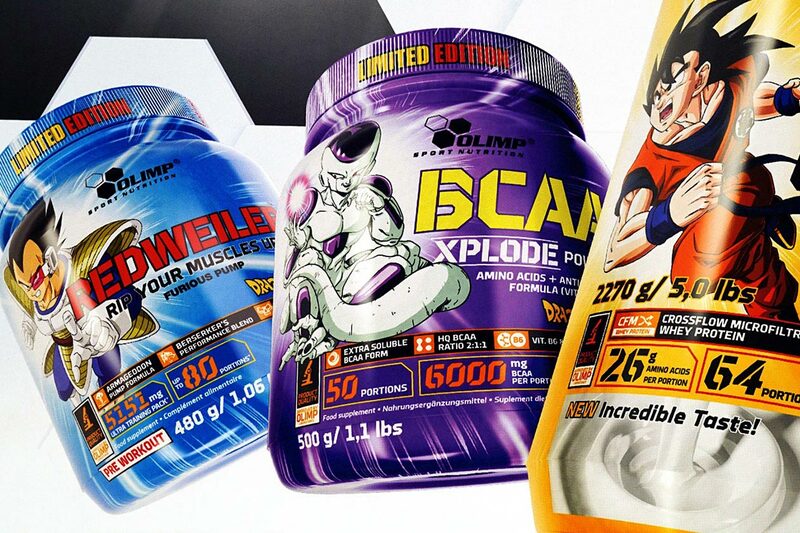 Olimp has debuted its limited edition and authentic Dragon Ball Z series of supplements consisting of an amino, pre-workout, and protein powder. The products are all special edition versions of previously released Olimp supplements with Dragon Ball Z themed packaging and a unique flavor. The legendary Saiyan Goku has been partnered with the European brand’s protein powder Whey Protein Complex which provides 26g of protein per serving. The protein comes from a blend of whey isolate and concentrate, with the flavor of the product being a clash of two tastes with White Chocolate and Raspberry. The next item is the Frieza themed BCAA Xplode Powder packing 6g of BCAAs and a gram of glutamine in a Forest Fruit flavor. The last Olimp Dragon Ball Z supplement is the pre-workout Redweiler featuring Vegeta in a Blueberry Lemon flavor and designed to help with energy, strength, and performance. Fans of Olimp as well as fans of the hugely popular anime Dragon Ball Z, can now grab any of the three limited edition products from the brand’s European website at olimpsport.com/eu. The Goku protein is the cheapest of the lot at €22.90, while the Frieza BCAA is €38.80, and Vegeta pre-workout at €42.90.